Christina Hollis: This Writing Life...in Summer. It's high summer here on the border between England and Wales. 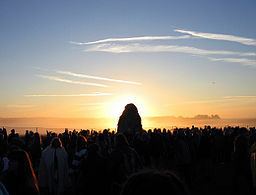 The 21st June is the Summer Solstice, and for the next day or two the days will be longer and the nights shorter than at any other time of the year. That means different things to different people. While Druids, hippies and others gather at Stonehenge to celebrate, I'm busy putting the last of my tender plants out in the garden, and looking forward to the first baby vegetables of the season. I'm already enjoying the lovely Turkish delight fragrance of the rose you can see further down this page, Louise Odier, and honeysuckle Graham Stuart Thomas as they drape round my favourite fine-weather writing spot in the garden. Their scent is particularly powerful at dawn, or after a shower. The trouble with all these extra hours of daylight is that it's not only the fruits, flowers and vegetables which get growing. The weeds have eighteen or more hours of daylight to stage their takeover bid, so it's hard to keep on top of them while I'm writing all day. When I leave the office, I have to catch up on all the cooking and washing before I can get outside and start weeding. We're usually eating new potatoes fresh from the garden by early June. The old saying that you should plant your early potatoes on Good Friday comes from the time when working people had hardly any paid time off, so they had to do all their chores on public holidays such as Easter. 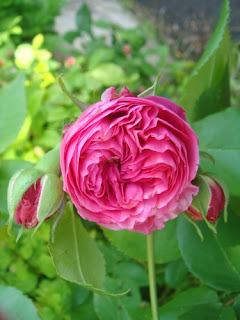 I was so busy with the release of His Majesty's Secret Passion and Her Royal Risk this year, I didn't get a chance to plant ours until much later. You can't stop a potato growing, so they're trying hard to catch up but it'll be a while before we'll get to eat them. You're supposed to sow parsley seed on Good Friday too, and I missed out on doing that too, this year! Right now, I'm working on a Christmassy short story. Publishing schedules are a bit like gardening— you have to think months in advance. If you'd like to help me choose the cover art for my next release, you can join my mailing list here.